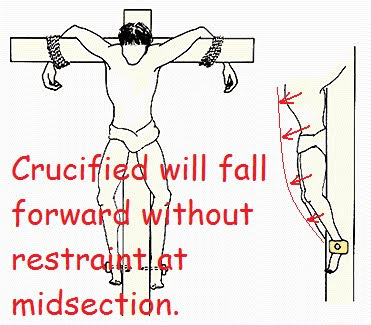 Crucifixion researchers relied on a steady stream of fresh cadavers and amputated arms and legs. That’s probably why most of them had been doctors in hospitals unscrupulous in using for their studies whatever remained on the operation table after surgery. Around 1900 for example Marie Louis Adolphe Donnadieu, professor at the catholic faculty of sciences in Lyon, France, nailed a cadaver of a man on a wooden board (picture at the right) for the sole reason that a seemingly petty question could be answered: Would the hands have supported Jesus without the nails tearing through the flesh. But if Donnadieu thought the gross demonstration had proven his point beyond any doubt he was mistaken. Some thirty years later another catholic surgeon, Dr. Pierre Barbet, complained about the low quality of Donnadieus cadaver. In his book A Doctor at Calvary Barbet writes about Donnadieus experiment: “The picture shows a pathetic small very skinny emaciated body … the cadaver I crucified in contrast … was totally fresh and smooth” (picture in the middle). The French surgeon also did experiments with “living arms” (meaning: just amputated) he attached weights to in order to prove that the nails were hammered through the wrists and not through the hands. But much more important than this revelation was the insight that the arms formed an angle of 130 degrees which allowed at last for an anatomical correct depiction of Jesus at the cross: the so called Villandre-Cross sculpted by the surgeon Charles Villandre with the help of the information gained by the experiment with Barbets cadaver. As crucifying cadavers has come out of fashion lately Zugibe was working with volunteers whom he bound to a DIY cross in his garage measuring critical bodily functions like pulse, blood pressure and respiration (picture at the right). He is convinced that Jesus didn’t die from asphyxiation but from traumatic and hypovolemic shock. Finding volunteers by the way was surprisingly easy. Members of a free church nearby were lining up to feel once like Jesus. Cadavers have been used to teach anatomy and surgical techniques, discover rates of decomposition, and even to develop crash test dummies. Corpses have also been used to settle anatomical debates about how Jesus of Nazareth might have been crucified and test the authenticity of the Shroud of Turin. Cast made of James Legg’s flayed cadaver. Full size image at Royal Academy of Arts. Because the Crucifixion has been depicted in countless of pieces of art, artists have debated the method the Romans used to crucify Jesus in an effort to make their work historically accurate. According to the Royal Academy of Arts, 19th century artists Thomas Banks, Benjamin West and Richard Crossway believed that painted portrayals of crucifixion were “anatomically incorrect” and they wanted to crucify a corpse to prove their hypothesis. In 1801 they got their opportunity with the execution of an 80-year-old pensioner named James Legg who was convicted of murder and hanged on November 2nd. Crape flayed Legg’s body and Banks another cast. Banks titled the casts “Anatomical Crucifixion” and for a while they were displayed in his studio. Over the years the casts were moved around. They were stored in Carpue’s anatomical museum, the dissecting room of St. George’s Hospital medical school, and the Royal Academy of Arts. Only the cast of the flayed body exists, no one knows where the cast of the body with skin is located. The Shroud of Turin is a holy relic that many believe is the burial shroud of Jesus Christ. The shroud is a rectangular piece of linen that measures 14.3 x 3.7 feet and has the front and back view of a man with his hands folded over his groin. The male figure in the linen seems to have injuries consistent with the Biblical accounts of the Crucifixion. In 1931 the Catholic Church wanted to substantiate the Shroud’s status as a relic. Church officials reached out to some doctors meeting at a conference in Paris for volunteers to analyze the Shroud and conduct experiments. Dr. Pierre Barbet, a surgeon at Saint Joseph Hospital in Paris, eagerly volunteered for the job. After examining the Shroud, Barbet noticed two rust-colored stains that looked like rivulets of blood that seemed to originate from an exit wound on the back of the right hand. In Stiff, Mary Roach describes the stains as “elongated” and coming “from the same source but proceed along different paths, at different angles.” Barbet argued that the stains on the back of the right hand were caused when Jesus had to keep pushing himself up on the cross in an effort to breathe and prevent asphyxiation. He used the angles of the stains to calculate the positions Jesus took on the cross. Barbet obtained an unclaimed corpse from an anatomy lab and had a cross built. When he nailed the hands and feet to the wood and stood it up, the cadaver sagged into the position like he predicted. But Barbet couldn’t figure out how the nails in the palms could support the weight of the body. So he did a second round of experiments on thirteen amputated arms donated by injured patients. One of Barbet’s nails eventually went through an area of the wrist known as Destot’s space. Destot’s space is an opening in the pinkie (ulnar) side of the wrist bordered by the hamate, capitate, triquetrum, and lunate bones. The problem with this claim is that the wounds on the Shroud are on the thumb (radial) side of the wrist, which is on the opposite side. So the wounds created during Barbet’s experiments and the Shroud wounds don’t match. Zugibe argues that divergent blood trails happened after Jesus’ body was cleaned and the water disturbed the coagulated blood causing some to seep out and split into two rivulets. He doesn’t know why Barbet made the mistake with the position of Destot’s space and the nail wounds in the Shroud despite pushing the nail through it during his experiments. Zugibe believes that the nails went through Jesus’ palm in a downward trajectory so that the tip of the nail exited out the back of the wrist. ← S.Africa: Another White Afrikaans woman being charged with Racism! Say what you will about Christianity but it’s the only religion that identifies the Jews, came anywhere near unifying the White world and prophesied the flood of invaders inundating our nations, for just starters. If you’re going to criticize Christianity it should be directed at Judeo-Christianity which is the Jewish perverted form of Christianity. With your misdirected barbs and ridicule all you’re doing is further dividing a house already divided and cutting your support base. Would any great general do that Jan? Huh?? – – If you took the time to study Christian Identity teachings and then look on the world thru that lens I think your opinion might change. It might take a couple of months to get a handle on it and you could save your spit for those who deserve it rather than your own brothers in arms. Religion is a fascinating topic. I personally LOVE what Ben Klassen did. He recognised a need for religion and he took National Socialism and turned it into the religion of our race – solid science, solid history. I do grasp a number of reasons why religion/a-racial-plan is necessary. Klassen pointed out that successful civilisations were always united by a religion. So I like the way he took history and science and fleshed it out into something solid and meaningful that would work for whites. Hence I’m a big supporter of Klassen and Creativity. I prefer that approach, where the rock solid truth is taught as opposed to myths. yes, for better or for worse humans need mythology it seems, these days its transvestites and your own genetic replacement in your homelands. same is true of the jews and their supporters ramping up year after year the teaching of the holocaust fable and anti nationalistic sentiments. back in the 70’s/80’s i was not indoctrinated into the holohoax in school here in australia, apparently that has also changed here and dont even get me started on how hard its shoved down the throats of the americans and europeans.